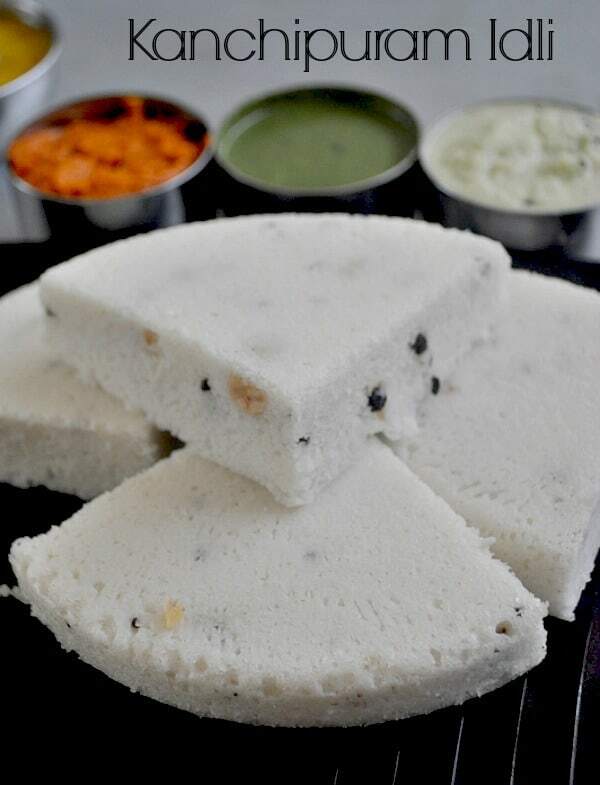 Kanchipuram idli is very famous among the Idli varieties. Kanchipuram idli is also known as “Kanchi idli”.MakingKanchipuram idli recipe in Chennai style is in my long time to do list. we call “idly ” in Tamil and “iddalige” in Kannada. This Kanchipuram idli recipe is a traditional method which is less time-consuming and very tasty recipe. Usually making idli takes 8 hours fermentation time and 3 hours soaking time for urad dal and rice. In this method is have used sour buttermilk for soaking the urad dal, while grinding the sour buttermilk is also added so it takes only 3 hours for fermentation. By this way, we can reduce the fermentation by 3 hours. Soak the rice in water,urad dal in sour buttermilk and fenugreek seeds separately for 3 hours.Grind urad dal with the buttermilk and fenugreek seeds in a grinder or blender, add little water at a time and make it into a smooth batter. Transfer to a large container. Now grind the rice into smooth paste ,pour this over urad dal mix.Add in salt and mix well.Cover this and let it ferment for 3 hours. The batter should be risen well. Mix this batter well. Crush ginger,cumin,pepper coarsely. Now heat the pan and add ghee temper the mustard seed and then the crushed spices, curry leaves, cashewnuts mix well with the idli batter. Take a vessel or a mould of your wish grease it and pour the batter around 1 inch thick and steam it in the idly pot as we make the regular idli. Once done leave it for few minutes and then slowly take out from the vessel. serve with your favourite chutney and sambar. 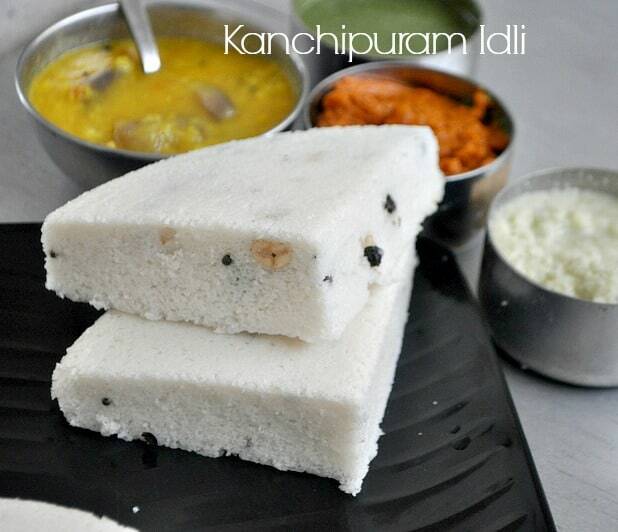 Kanchipuram idli is very famous among the Idli varieties. 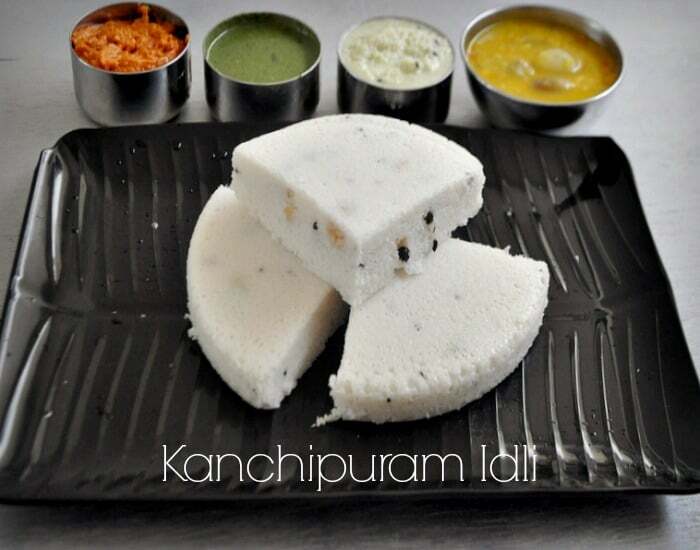 Kanchipuram idli is also known as "Kanchi idli". Crush ginger,cumin,pepper coarsely. Now heat the pan and add ghee temper the mustard seed and then the crushed spices, curry leaves, cashewnuts mix well with the idli batter. Take a vessel or a mold of your wish grease it and pour the batter around 1 inch thick and steam it in the idly pot as we make the regular idli. Once done leave it for few minutes and then slowly take out from the vessel. serve with your favorite chutney and sambar. You can make the idli in thonai also or in any mold of your choice. For greasing and tempering use ghee so that the idly will be tasty. i didn't add any yeast or baking soda. If you want to make it instantly you can add yeast. Now tell me which is your fav combo with idli? sambar or tomato chutney or mint chutney or coconut chutney?